2015-Mar-23: At 22 minutes after midnight of March 6th, a magnitude 6 shallow focused earthquake occurred along the mid ocean ridge about 2,000 miles from the stranding site in Bunbury Harbour south of Perth Australia. The is the same spot where on 27 June 1865, the Coya, a 516-ton iron barque from London, experienced two very severe earthquake shocks accompanied by loud rumbling noises and a highly disturbed ocean surface (link). No doubt the epicenters of all 3 quakes were close and their intensity similar. 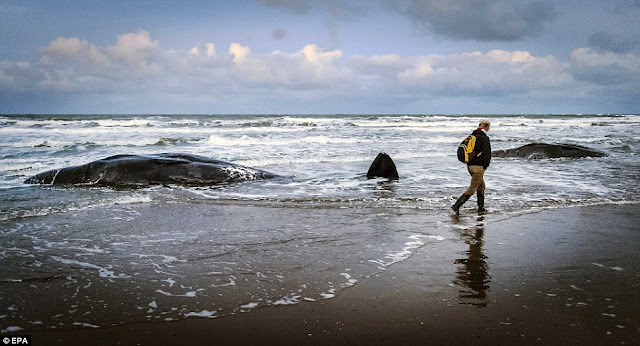 The question for my readers is do you believe an earthquake that generates severe shocks in the water, and highly disturbed surface, is capable of causing sinus injury in an entire pod of whales? The injured pod would make it back to the surface. However, with their sinuses ruptured, they would not be able to navigate. With their bisn disabled, they would gather in a tight group and be carried downstream by the surface currents. Sharks would soon move in behind them. They would be forced to swim along with the current wherever it carried them. As it so happened, the current was flowing towards Perth Australia. This link will take you to a Google map that shows you where the earthquake occurred in relation to the stranding site. Below is a chart of the ocean currents in the area. The epicenter of the earthquake is in the bottom left of the chart above. You can see how the surface flows would guide the injured pod towards Finders Bay. Although the dominant boundary current off Western Australia is the south-flowing Leeuwin Current, there is a cool northward coastal countercurrent running close inshore in the extreme southwest during the summer months called the Capes Current. Strong northwards wind stresses between November and March slow the Leeuwin Current (which moves offshore) and draws in the Capes Current. Watching this video (link) should make it obvious that these whales were washed in with the incoming current due to a rising tide and shoreward winds. Watch the first first part several times and you can see the whale in the background swimming quickly with the flow of the current. The tide was rising during the stranding and current was washing towards the rocks. The earlier seaquake encounter had knocked out their sense of direction; they had no idea where they were going or which way to swim to avoid smashing the rocks. The whales were acoustically as blind as a deafened bat. Twelve of the animals died quickly. and rescuers dragged another four whales five nautical miles out to sea, where they were released. It wan't take long for the sharks to move in and take these four animals. Mr Williams, with the Parks and Wildlife Services said, "It's almost impossible to identify a cause. It could be an individual animal that's injured and it's come into shallow water and the rest of the family followed, it could be that in the surrounds of the Bunbury harbor with the various breakwaters and groynes that that's interfered with their bio sonar and they've got confused in their navigation." Both these answers are outright stupid and misleading. Pilot whales are pelagic (deep water) NEVER seen inside a harbor unless it is during a stranding. Furthermore, any idea that the entire pod would commit suicide because a leader got sick is an outright dumb as it gets. The instinct to survive in these wild animals is intense. Under no circumstance would they swim into an trap and get washed inot the rocks because a buddy was sick. Ugh... it make me want to throw up my breakfast when I think about how studid whale scientists really area. 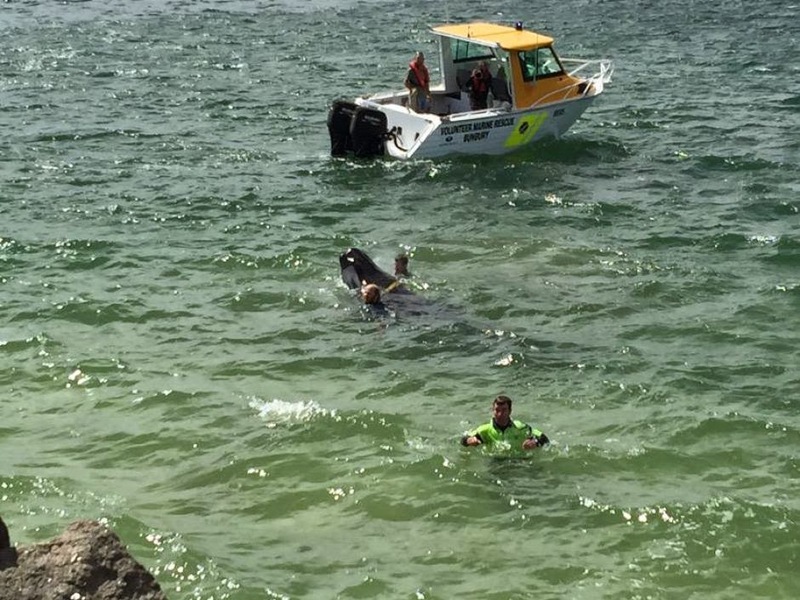 Earlier Mr Williams explained that, "The dead whales have all been removed from the water to discourage sharks from coming into the area." Jesus H. Christ, this is the only thing he said that makes sense. He knows sharks are in the water. They likley chased the seaquake-injured pod into the harbour.